Luke popped round for an evening game and we played another Helldorado, this time with the terraforming rules for setting up the battle field. Luke set up all the terrain he could as crevasses between me and him to keep me away from him missile troops. 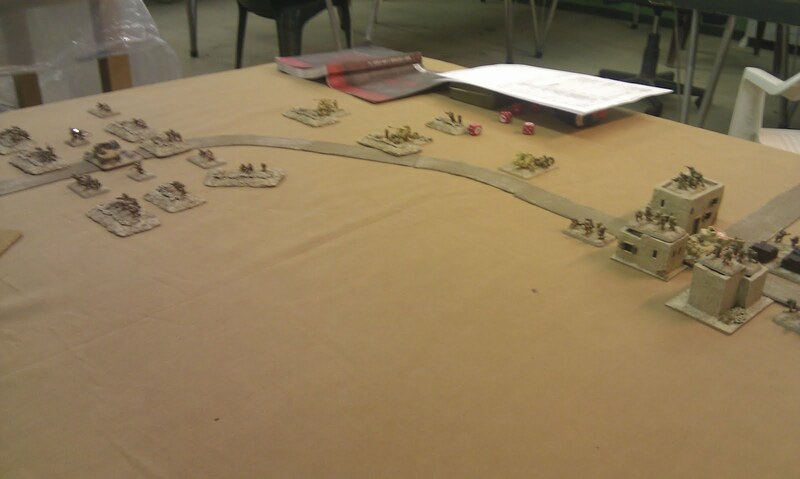 Despite this it was not his evening, I managed to brave his fire and grab the objectives on one side, and on the other side managed to cut through the Dopplesoldiers and claim victory. Despite this it was a fun little game, although I think I need to add to my Westerners to help Luke out. 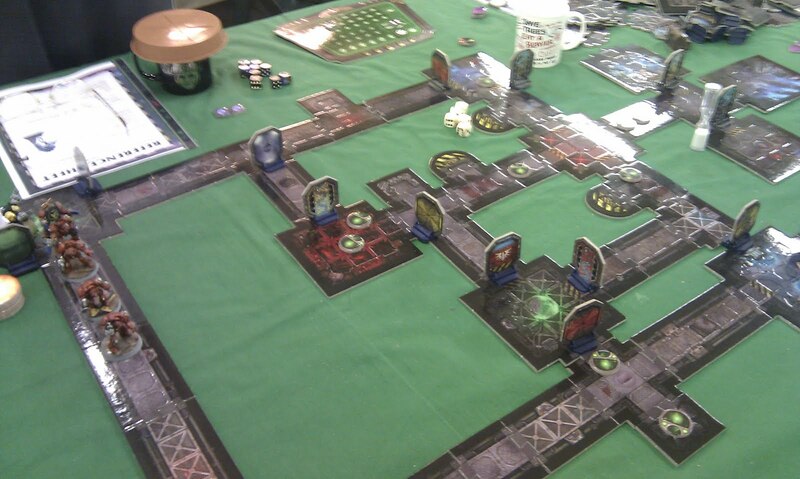 Mike arranged a big game of Space Hulk. I liked the idea of this, but was concerned how well it would work. 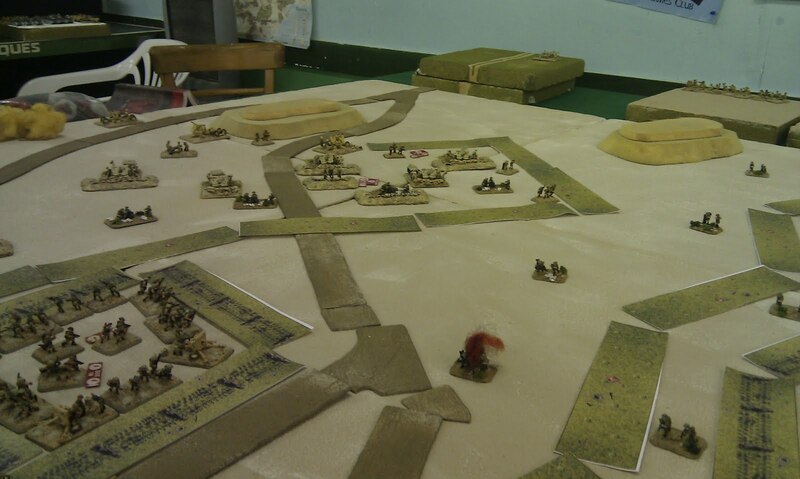 We used the latest rules and tiles, but based the scenario on one from an older edition that linked a number of missions together into one massive board. 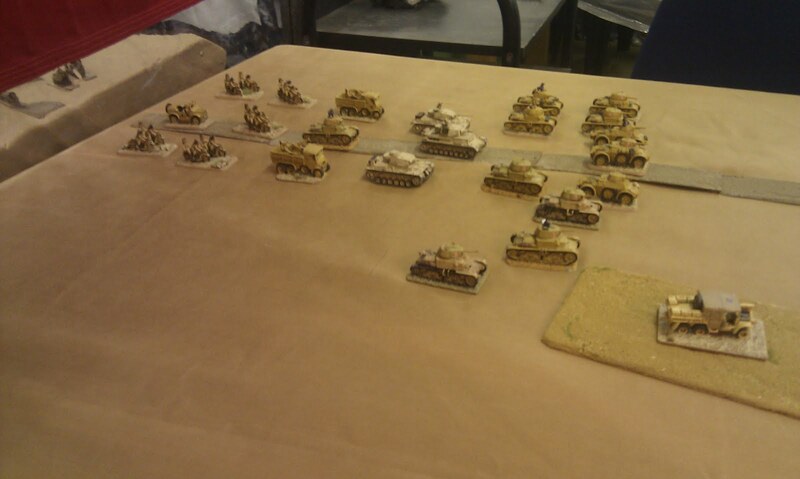 In fact so massive that we had to have 'scrolling' terrain even with two copies of the box set. 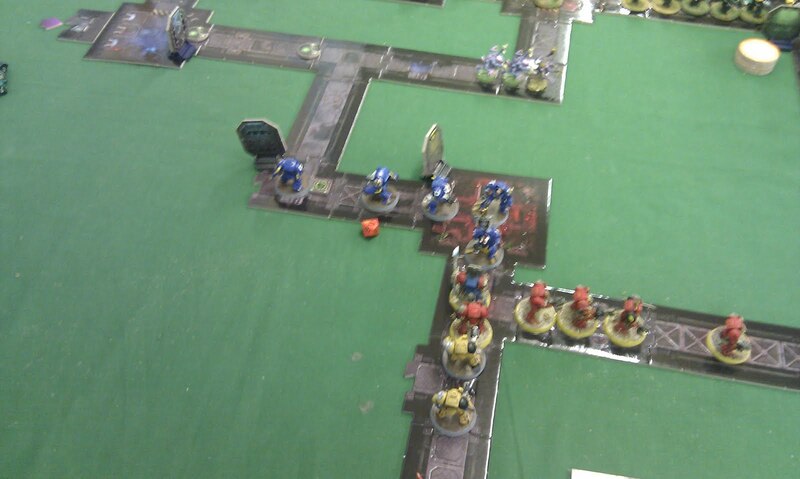 We have three players on each side, the Marine players having a squad each and with plenty of blips for the 'Stealers, including the options to have two brood lords! 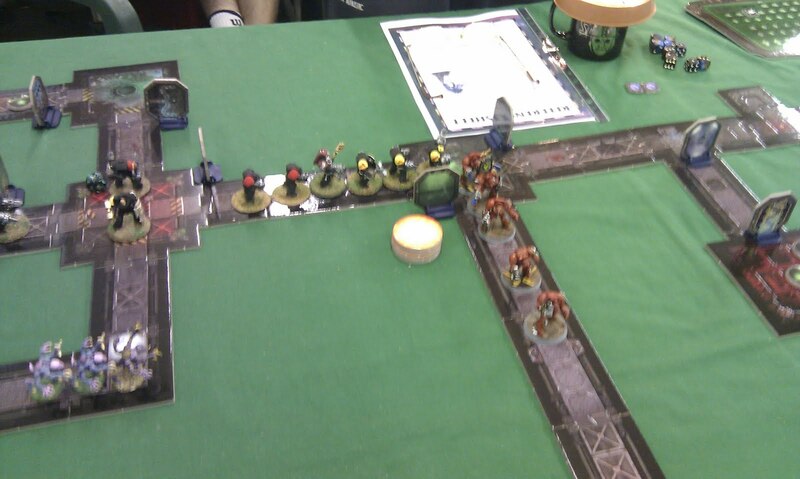 Things started out well on my side as I combined with one of Mikes teams to advance on what appeared to be lightly held passages. However on thew other side all the enemy seemed to be attacking Steve H's Shadow Marines, and although his two assault cannons were holding them at bay, it was chewing through his ammunition. And then the inevitable happened and he ran out and then his men started to fall and had to fight to the front and rear as they tried to advance. Then came the that moment of heroism that games like this need. 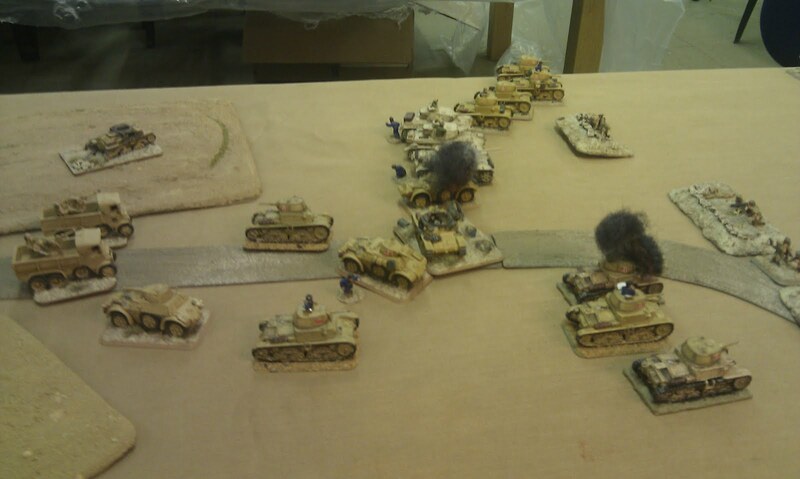 The sole survivor of Steve's two squads got caught at a corner and was attacked by hordes from both directions, but kept holding them off, turning an cutting them down. Once finished he then hurried to catch up with the others. Back on my side I was burning through Psi-Points trying to keep up a force barrier to prevent the Brood lord advancing on me as my firing was totally ineffective. I finally ran out and he advanced on me and I cut him down with surprising ease! 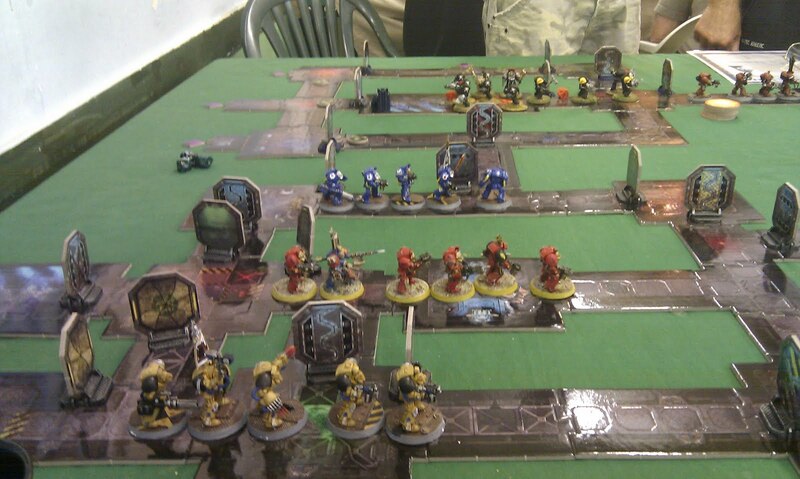 By now it was getting very late and the marines, although having taken casualties had advanced far enough to cut off the 'Stealer re-enforcements and they admitted defeat, not having enough blips left to counter the remaining terminator marines. 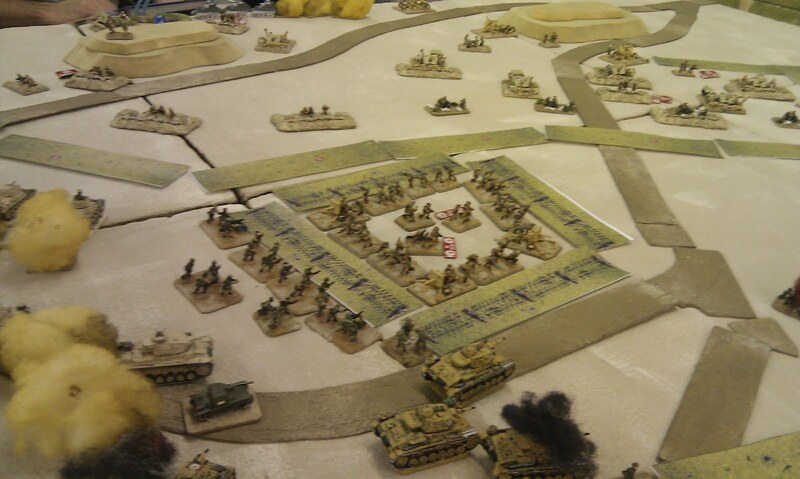 This was a great fun game and I was really pleased how well the big game worked. Over the past couple of weeks I have posted a lot of updates. Most of these where half finished posts I have got round to completing, or uploading the accompanying photos. Now I am up to date again I will try to keep up to date. Hope you are all still enjoying the blog, please share your comments. 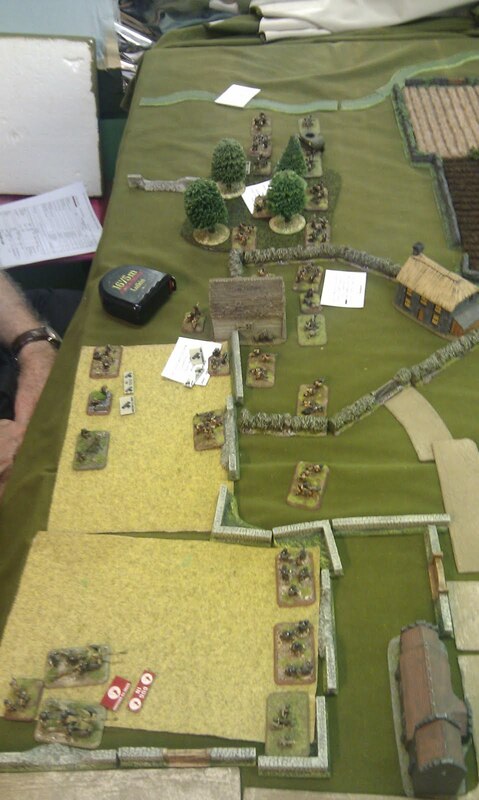 Luke and I managed to fit in our first mid-week game for quite a while and went back to the good old Flames of War. 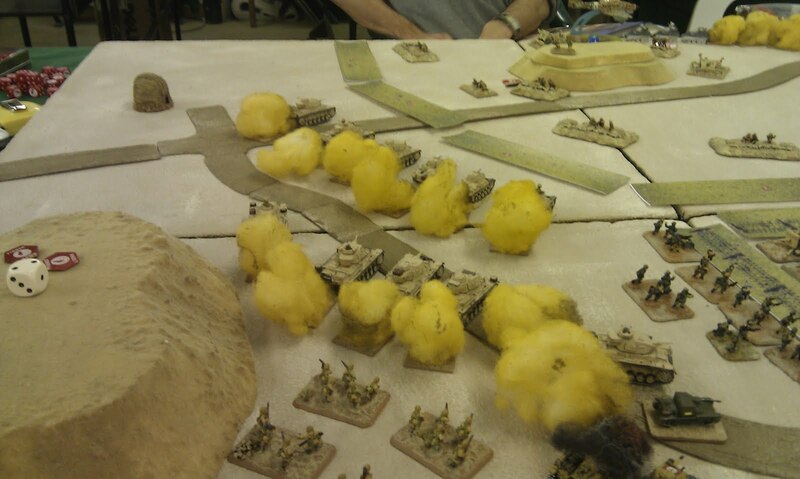 We decided to ply mid war, and by coincidence both try out something different. 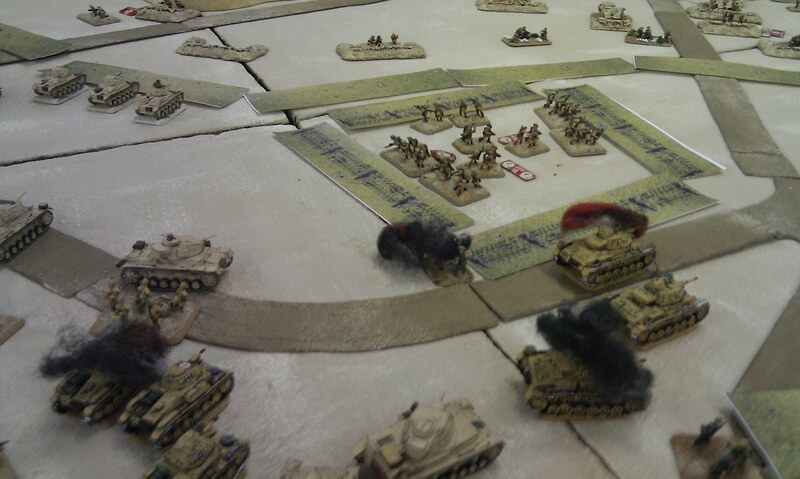 I took a Compangnia Carri with some allied Panzers and Luke took an Infantry company with I tank support.We played a no retreat mission. As I launched my main attack I quickly encountered problems. 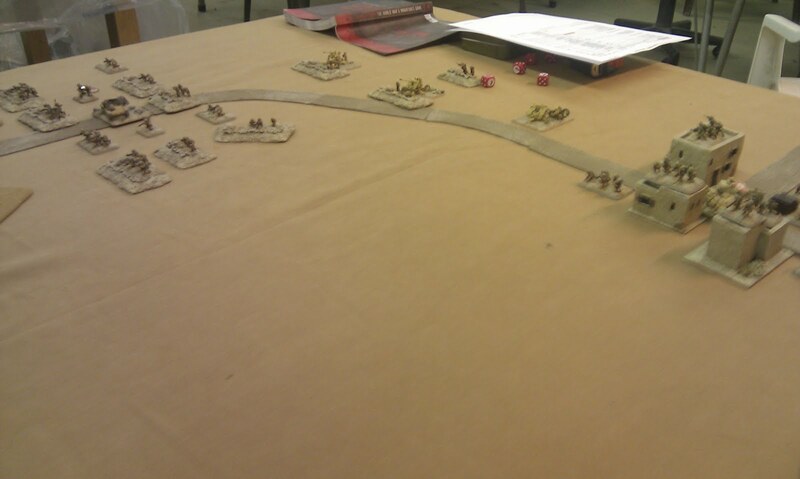 We play that we roll a general terrain type up from the 2nd ed. 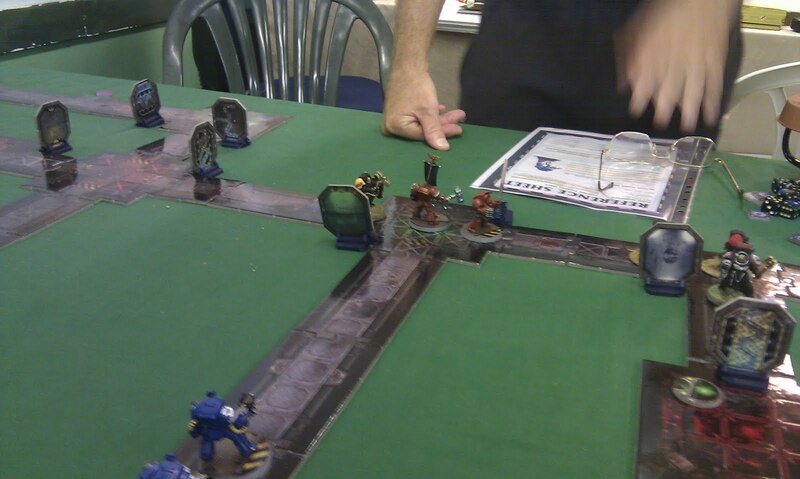 rule book and then roll for type when contacted using the tables from Hellfire and Back. This meant I knew that there were wrecks in front of me, but it was only as I moved forward I discovered most of them were actually minefield which channelled my force even further. 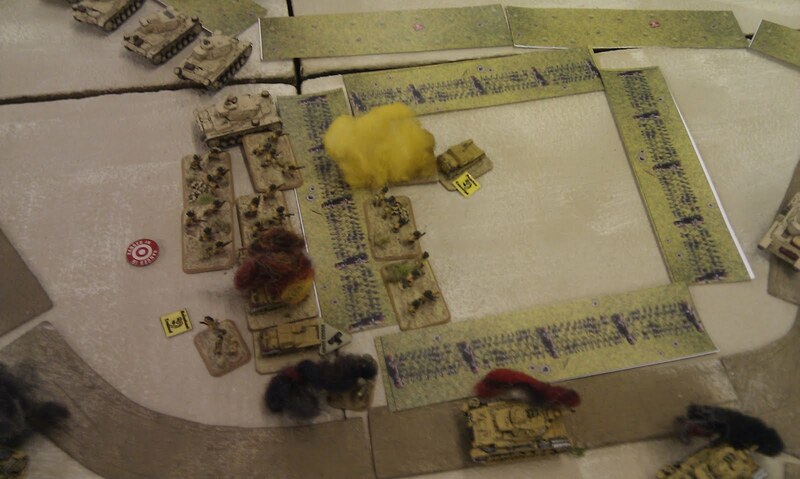 To make matters worse my first assault by armoured cars was driven back by defencive fire. 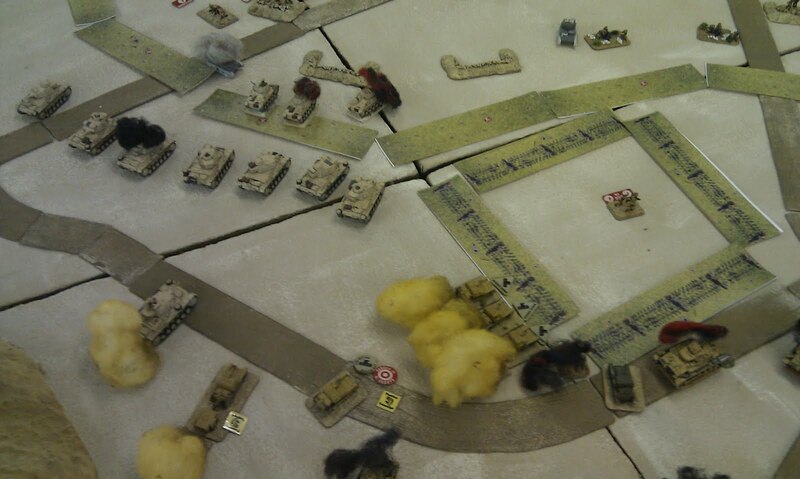 On the other flank I had discovered the 2pdrs in ambush and attempt to assault them but was repelled, so my armour swept to support the other flank. 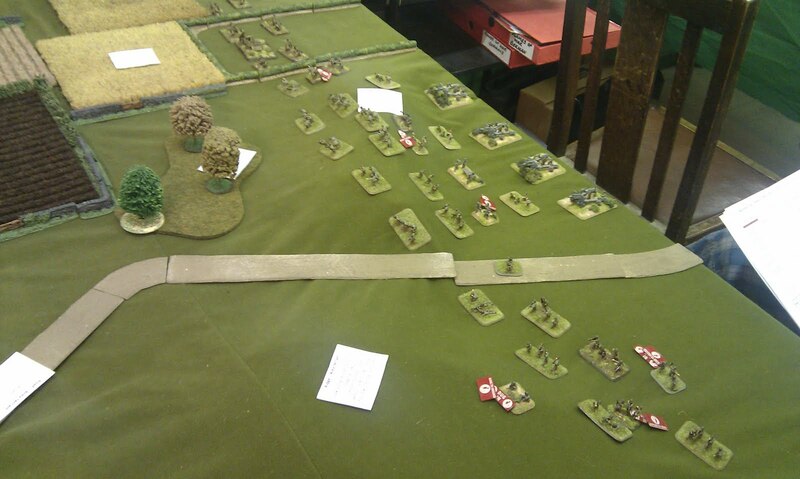 Here I had managed to assault again, but was again repelled except for the last platoon I could attack with, that managed to drive the Brits out of their defences. There now started a couple of bitter turns of fighting as Luke desperately tried to hold on and prevent my victory while waiting for reserves. It was now a race for me to drive him off properly before the I-tanks arrived and stared rolling me up as I had very little that could cope with them. Fortunately I as just able to drive him off, they had arrived, but had not got near enough to be a threat. 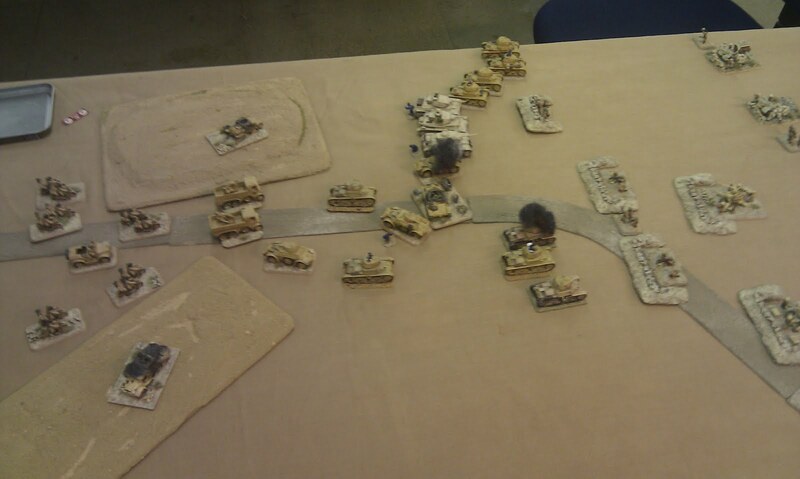 The burning wrecks surrounded the objective (below), but the Italians had captured it and won very a hard fought battle.